Best. Summer. Ever. At least it was supposed to be. Kate can't wait to attend the elite girls' hockey camp in Denver and go up against some of the best players from around the world. But then Mom says Kate has to stay with her grandma in Denver, who doesn't care about Kate's hockey dreams at all. And two players at the camp have it in for Kate both on and off the ice. Toss in a tough-as-nails coach and a huge family secret, and Kate's perfect summer isn't turning out quite like she planned. 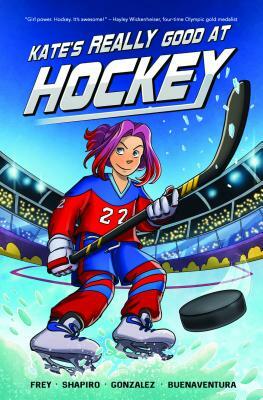 Kate's Really Good at Hockey is a story about family, friendship, and doing what it takes to follow your dreams. Christina Frey is a a Baltimore-area writer and editor with almost twenty years of experience in writing, editing, and publishing, she has worked with bestselling authors, independent authors, and emerging writers to improve structure, characterization, plot, dialogue, narrative, grammar, and diction. She is also co-executive of the Editorial Freelancers Association and an active member of the American Copy Editors Society, committed to excellence and professionalism in the industry. - Howard Shapiro has written four children's books, three graphic novels and a biography. He lives in Pittsburgh, PA where he runs the day-to-day publishing side of Animal Media Group LLC bringing ten years of indie publishing experience to the role.